Familial hypercholesterolaemia (FH) is a condition that is genetically determined, and it causes a high level of cholesterol in the blood. The families affected have experienced a high incidence of coronary heart disease (CHD) with early deaths. This has been a serious problem for them during the second half of the 20th century, and as a consequence there has been a great deal of attention given to these families. But the connection between FH and CHD is not entirely straightforward. 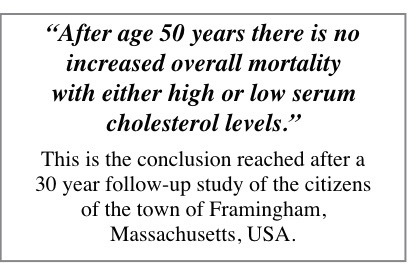 The seriously flawed diet-cholesterol-heart hypothesis of the cause of CHD has dominated medical “non-thinking” up to the present time. It has a variant, the genetic-cholesterol-heart hypothesis. It has become clear to most informed people that diet cannot be the cause of CHD. It has also become clear that the great majority of cholesterol in our bodies is synthesised within us and has not been taken in the diet. 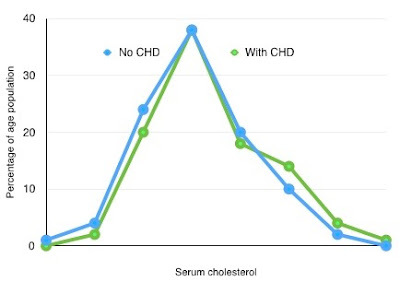 CHD, with or without a high cholesterol level in the blood, has run in families very strongly. It has been much more common than would be explained by simple Mendelian inheritance. However FH is genetically determined and it has a pattern of Mendelian inheritance, as we will see. A high level of cholesterol in the blood can lead to deposition of cholesterol in body tissues, but this does not necessarily include the coronary arteries on the surface of the heart. We have seen the example of the high blood levels of cholesterol typical of the liver disease primary biliary cirrhosis (PBC) and it does not lead to an increased risk of CHD. It is important to appreciate that CHD is not due to “cholesterol”, and that cholesterol within the arterial wall is a secondary phenomenon, secondary to an underlying inflammatory process. CHD is not a dietary disease and it is not a metabolic disease. It is an inflammatory disease. This was first recognised by Rudolf Virchow in the late 19th century but then, eclipsed by the diet-cholesterol-heart hypothesis, it remained forgotten until the late 20th century. Although CHD clearly runs strongly in families, this is a form of non-genetic inheritance, probably the inheritance of a micro-organism rather than genes. However there is clearly an important genetic component in familial hypercholesterolaemia (FH). CHD is worse in these families, for reasons that I hope will become clear. Also, that in the long term things are not altogether bad for those people with FH. During the 20th century there was an epidemic of CHD and this is beyond dispute, that is by people who have taken the trouble to read the original papers which have described very clearly its emergence and its decline. During this epidemic people with FH fared very badly and had earlier deaths than the average population. Their standardised mortality ratio (SMR) reached almost twice that of the general population. Very full records have been identified for a large family in The Netherlands, including ages at death over a long period of time. It is now known that the members of this family have FH. From the records, mortality rates have been compared with the population average (mean). If we compare an individual with the average then we are looking at his or her standardised mortality ratio (SMR). The average reference level is 100 and an SMR less than 100 indicates a survival advantage. An SMR of more than 100 is what you do not want, a high death rate. It is similar to IQ but with IQ a level greater than 100 is considered to be an advantage. 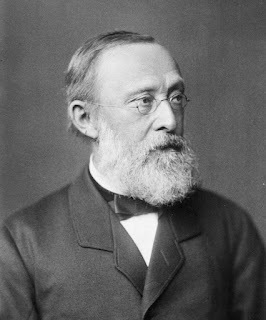 The size of the family enabled 250 people to be studied, starting with a single pair of ancestors in the early 19th century. In those tested in more recent years the blood cholesterol levels were measured and were in excess of 10 mmol/L. Even more recently they have been identified as being carriers of the V408M mutation (see next Post). The average blood level of cholesterol in the general population is about 5.9 mmol/L, slightly higher in young men with CHD. We can see this in Figure 2. The distribution curve of blood levels of cholesterol is shown, for young men without CHD between the ages of 30 and 50 years. If we then look at the men of the same age with CHD, we see that the curve has shifted slightly to the right, to a slightly higher level. However there is a major degree of overlap. CHD deaths have been quite rare in this age-group, and have now effectively come to an end. In Figure 3 we now look at a slightly older age-group of men, between 50 and 62 years, we see that the distribution curves are identical. Could the message be any more clear than this? 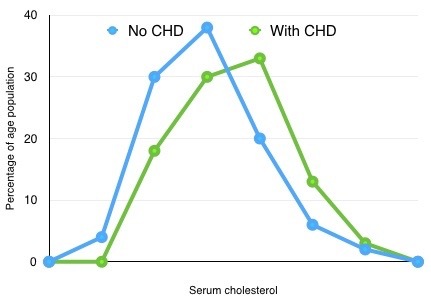 It obviously has implications for families with high cholesterol, FH. 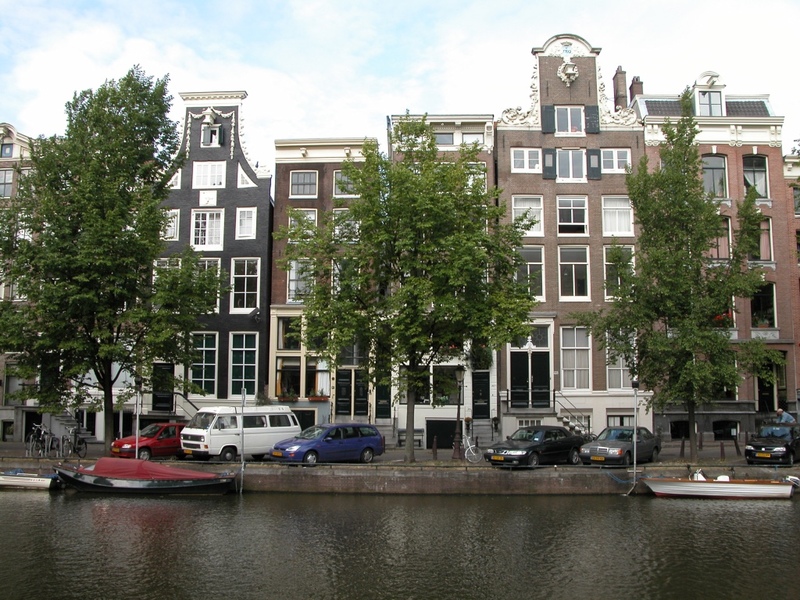 We can see the average SMR of the family in the Netherlands in Figure 4. It has changed considerably during the years 1830 to 1999. In the 19th century the family members had very significant survival advantage, with SMR for females of only 45 and for males 70. At that time it was clearly a very good thing to have FH. The study indicates that mortality of the FH family relative to the general population increased only after 1915. In the mid 20th century the SMR reached a peak of almost 200. This was very serious with premature deaths from CHD in the family members and an SMR twice that of the general population. The pattern of death in the families with FH follows that of the epidemic of CHD. 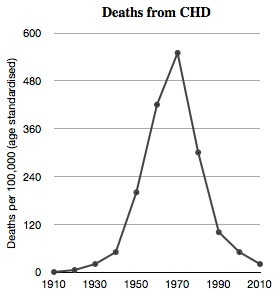 The rise of the graph coincides with the emergence of CHD in the 1920s. The peak was reached in about 1960-70 and thereafter the SMR, the relative death rate fell. So when there was a high prevalence of CHD, people with FH had a higher incidence of death from it. As the overall death rate from CHD in the population diminished, the relatively high SMR for people with FH came back to the national average. The last point on the graph represents the time period 1970-99. This is the time of a 90% drop in CHD deaths in the UK. 1999 was very different than 1970. It is unfortunate that the study did not divide 1970-99 into two periods of 1970-84 and 1985-99. A large drop of SMR might then have become visible. It would be fascinating to see how the families with FH have fared since about 1980 when the recordings stopped. I have written to the authors of the paper asking if the investigation of the families will continue but they tell me that this is unlikely to happen. It is a unique opportunity lost. We can only speculate that those with FH will in the 21st century revert to a much better health profile and lower SMR than the overall population. This important study is an excellent example of the interaction between genes and environment. A genetic advantage in one time or place might turn to be a disadvantage in other circumstances. Genetic assessment of FH is very important but it becomes more complex. I think it advisable to close this Post here and to publish an additional post very shortly. It will be "FH - Genetics & Mutations". British Medical Journal 2003; 322: 1019-23.